Never captured, his identity is one of English's most famous unsolved mysteries. Of the eleven Whitechapel Murders, it is widely believed that Jack the Ripper is directly responsible for five of them. It is possible that the Ripper may have claimed more than five victims, but most experts agree that at least five of the East End murders were the work of Jack the Ripper. he press had linked Smith’s murder to the subsequent Whitechapel Murders, but most experts later believed that particular murder to be the result of random gang violence. Whitechapel was home to many notorious gangs who would patrol the streets of Whitechapel harassing unfortunate women like Emma Smith demanding they pay them money in exchange for "protection". From August 7 to September 10 in 1888, "Jack the Ripper" terrorized the Whitechapel district in London's East End. He killed at least five prostitutes and mutilated their bodies in an unusual manner, indicating that the killer had a knowledge of human anatomy. Jack the Ripper was never captured, and remains one of England's, and the world's, most infamous criminals. It's all took place within a mile of each other, and involved the districts of Whitechapel, Spitalfields, Aldgate and the City of London, but in London's East End in the autumn of 1888 was never apprehended. Despite countless investigations claiming definitive evidence of the brutal killer's identity, his name and motive are still unknown. The moniker "Jack the Ripper" originates from a letter written by someone who claimed to be the Whitechapel butcher, published at the time of the attacks. Many of London people called Jack the Ripper is " The London Monster" because he killed of his victims. Media bias shown through the newspaper in actual fact, much of what we think we know about the Ripper killings is the result of historical speculation, biased media coverage, or simple folklore. Even the name “Jack the Ripper” originates from a letter sent to a London newspaper — a letter now widely believed to be a hoax. We can't even be completely sure that all five Ripper murders were the work of the same individual, or that other murders were not committed by the Ripper. Although modern scholars put the number of Ripper victims at five, contemporary newspaper accounts identified at least six and sometimes more, attributing other murders to the same culprit. 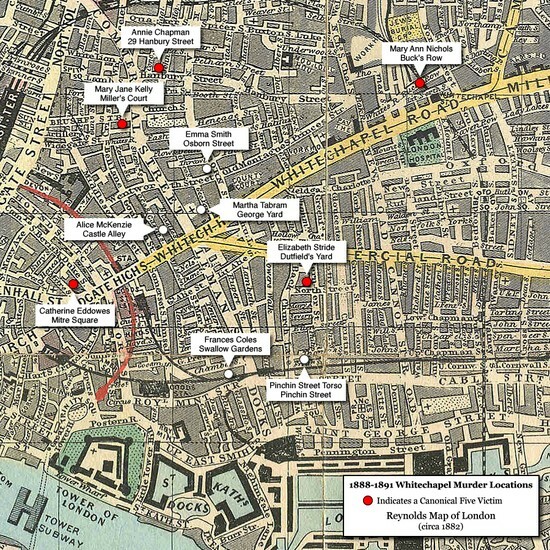 Jack the Ripper kills at least 5 woman have been killed from different many locations. A trail of blood led the police to a doorway nearby where a message had been chalked. it read, "The Jews are not the men to be blamed for nothing". For some inexplicable reason, the head of the Metropolitan Police Sir Charles Warren, ordered it to be rubbed out! So what could have been a valuable clue was destroyed. A failed barrister, a polish Jew, a mad doctor, a royal prince, even a Jill the ripper has been but a few of the ongoing suspects emerging in a never ending game of hunt the ripper. 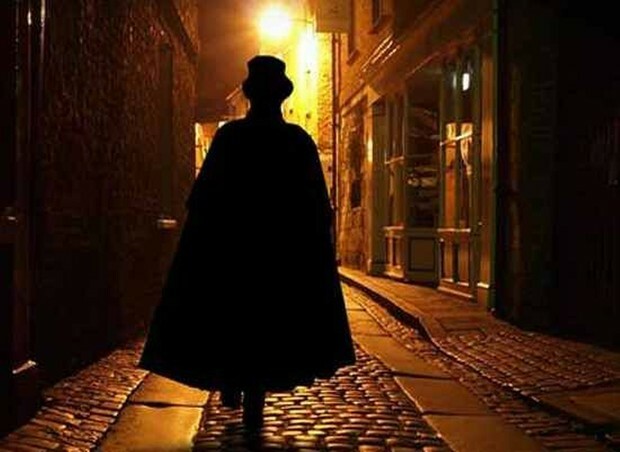 One thing seems certain, whether Jack the Ripper was a doctor, butcher, slaughter man, hairdresser or barrister, his identity will remain forever hidden in the shadows of the Victorian night.